Akshay Karnewar struck his maiden first-class century from No. 8, and the rest of Vidarbha’s lower order chipped in with useful contributions as they took a crucial 95-run lead against Rest of India on the third afternoon of Irani Cup in Nagpur. Karnewar’s 133-ball 102 – with 13 fours and two sixes – helped the Ranji Trophy champions post 425 in response to RoI’s 330. Thereafter, RoI batted for nine overs in their second innings, but lost opener Anmolpreet Singh early. 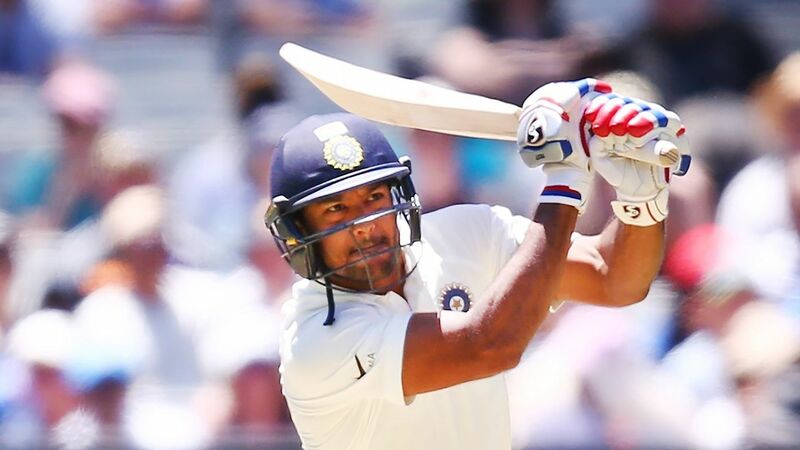 The teams broke from tea with Mayank Agarwal (22*) and Ajinkya Rahane (3*) in the middle. Karnewar was ably assisted by overnight batsman Akshay Wadkar, whose 139-ball 73 had arrested a collapse on the second day. Despite losing Wadkar before lunch, Karnewar did not curb his aggression. After reaching his half-century, Karnewar took on the slower bowlers. He struck the day’s first six, when he smashed Dharmendrasinh Jadeja over midwicket, and he followed it up with a leg glance in the next over to take Vidarbha closer to the RoI total. The new batsman, No. 9 Akshay Wakhare, then tickled a length ball down to fine leg, and Vidarbha had the lead – in the 114th over of their innings. The 76-run eighth-wicket stand between the duo was finally broken just after lunch, when Karnewar had a rare lapse in concentration. He shaped to pull Chahar’s half-tracker over midwicket, but the ball stayed low and trapped him in front. Wakhare soon followed, bowled off Chahar’s googly while trying to drive through the off side. Vidarbha were 56 ahead at that stage, but the last-wicket stand of 39 between Yash Thakur (10) and Rajneesh Gurbani (28 not out) frustrated RoI further after Chahar’s double-breakthrough, and a drive to long-on from the latter took Vidarbha past 400. Rajpoot later claimed the final wicket, with Thakur lbw to one that swung in late. Nineteen-year-old Chahar (4-112) was the pick of the RoI bowlers. He dismissed Vidarbha’s two highest scorers – Karnewar and Wadkar – and wasn’t afraid to show off his variations, earning two wickets courtesy his wrong ‘un. Chahar could’ve had a fifth wicket, in fact, when he found the outside edge of Gurbani’s bat in the 140th over, but RoI captain Ajinkya Rahane fluffed the catch at first slip, much to the dismay of the other three close-in fielders. In the morning, Karnewar had struck three consecutive boundaries off Rajpoot to hand Vidarbha a rapid start to the day. The flurry even led to a brief exchange of words between the two men. He continued confidently, though, bringing up his century in glorious fashion when he lifted a muscular six over midwicket off Jadeja to get to the milestone in the over before lunch. In the nine overs that RoI batted before the tea break, Vidarbha captain Faiz Fazal opted to give left-arm spinner Aditya Sarwate the new ball. And the plan paid off when Anmolpreet looked to take Sarwate on in the seventh over, only to toe-end a leg-side heave straight to long-on. At the break, RoI still trail by 60 runs with nine wickets in hand.